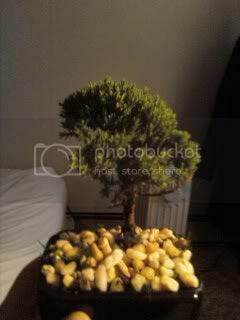 I was just given this bonsai as a gift yesterday. I have no experience with these types of plants and was told they are hard to care for. I'm not quite sure but i did some picture comparisons and it looks like a Juniper Procumbens "nana". Those are links of 2 pictures i took. That quality isnt so good...but I was wondering if anyone could help me. 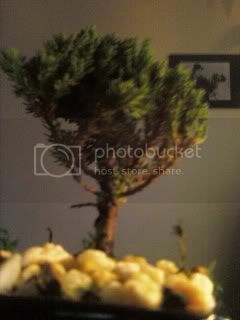 Is it a Juniper? It also seems my plant is turning brown underneath. What can I do to save it? Also I live in new jersey so it is extremely cold this time of year. I'm not sure how long to leave it outside for...or even if I should. Is indoor light good and if so for how long?? Fwiw, any Juniper *must* be outside; nbo excuses They can handle most any weather the USA can throw at them, just give the roots some protection from deep-freezes, etc. Keep it on the dryish side for now. I think, just from hearing your location, and given that it's an evergreen, a few guesses can be made. However, they're slipshod guesses and each requires different care. A Juniper of some sort is a likely candidate. More likely if it was purchased in a mall or home center. As already stated, if it's browning and it's a Juniper, chances are likely that it it already dead. But, I've also seen Chaemecypris <sp?> (False Cypress) for sale in our area, alsthough less so in recent years. These also need to be kept outside, but a little more sheltered. FWIW, the False Cypress are an excellent alternative to J. procumbens nana for "instant" bonsai, and available at most nurseries in season. But here's the thing, during the holiday season here, a lot of non-garden stores or non-garden specialy stores, and even some garden stores, bring in a variety of evergreen "trees". For instance, my local supermarket brings in potted "houseplant" Cypress, Rosemary, etc., all subtropical (from warm Mediterranean, or northern Central American/southern North America, etc., areas). Your tree could be one of these and, if so, would require that it be kept indoors, or, at most, in a cold room. I am currently growing one of these trees (obtained as a whip last year) indoors, completely, and it has been doing very well in a mostly organic soil in a greenhouse window that also supports full tropical trees. With these trees, some browning may be something that could be recovered from. If you can get a better picture, it would maybe go a long way towards us being able to help you. But, right now, there's really not a whole lot of advice (see above examples of what it could be) that can be offered since it could be conflicting. Ditto to all just mentioned. I just did not have the time to go into detail I immediately thought of the seasonal stuff found at the Garden Centers. Those Rosemary 'trees' (amongst others) are a *great* potensai, IMO. Very worthy usually if you treat 'em proper! can you look at my tree and see if you know what it is. Its in the Lost Care Instructions converstion. What Kind of Bonsai do I Have? Plz Help!! !